After the July 11th battle of Silkaatsnek, Pretoria was cut off from Rustenburg and the Western Transvaal and concurrent events at Elands River. The Boers under De la Rey controlled the passes of Silkaatsnek and Commando Nek, and the road further along Die Moot. Consequently, on August 1St General Ian Hamilton’s force moved out from Pretoria on the road to Rustenburg along Die Moot. His objective was to march into the disturbed Rustenburg District and bring Baden-Powell’s forces back to Pretoria. Brig—Gen B T Mahon’s cavalry and mounted infantry moved out at the same time taking the northern side of the Magaliesburg. Communications between the two columns was non-existent since there were no troops (with a heliograph) on the summit and northern slopes, which were occupied by Boers. Mahon made slow progress due to the thick bush and sniping. Thinking that Mahon might be in difﬁculty, Hamilton considered it necessary to break through the mountain at Silkaatsnek. Intelligence was that 3—400 Boers under Cmdt. Coetzee held the Nek without any guns. De la Rey, with three quarters of his force and guns was on the way to prevent Gen. Carrington’s relieving force from reaching Elands River. General Hamilton made his HQ at the Rietfontein fort where he had telegraphic communications with Pretoria. 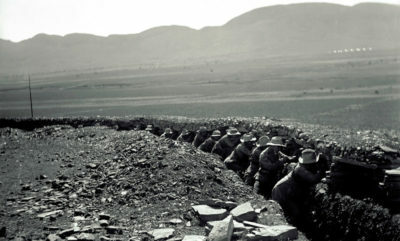 A three-pronged attack was planned —- a frontal assault backed by a large amount of artillery, a party of 50 Hickman’s Mounted Infantry to attack along the crest of the mountain from the East [perhaps something had been learnt from the ﬁrst battle], whilst Mahon to the north would intercept the Boer retreat. On August 2nd of the four infantry battalions at his disposal Hamilton warned the Royal Berkshire Regiment and the Argyll and Southerland Highlanders for the attack. The Berkshires were to clear the eastern heights with the assistance of Hickman’s mounted infantry along the crest. The cliffs towards the summit are sheer above a 45° wooded slope and the only access to the summit was by the exposed shoulder of the pass or up a narrow gully further along. The gully can be identiﬁed today by the boulders that show recent ﬂaking where bullets struck the attacker’s cover. The Berkshires had difﬁculties, sustaining more casualties than if Hickman’s party had arrived in time to assist. By eleven o’clock the Berkshire’s two front line companies had reached the top under a heavy crossﬁre. Sgt. A Gibbs had gone to reconnoitre and was shot and mortally wounded as he reached the top. Pt. W House then rushed out from cover [despite being cautioned not to do so as the enemy ﬁre was very intense], picked up the wounded sergeant and endeavoured to bring him into shelter. In doing so he was himself wounded in the head. However, he warned his comrades not to come to his assistance, the ﬁre being so severe. The Argyll and Southerland Highlanders made good progress on the right ﬂank using the thick scrub cover at the stream to within 100m of the pass. Their left ﬂank was held back due to the exposed nature of the ground, as the heights had not yet been cleared. The batteries, including 5-inch guns, were ﬁring from Rietfontein at groups of men visible above the cliffs on both sides of the Nek. After the occupation of the heights the centre and left ﬂank resumed its advance passing the cairns of the ﬁrst battle. The Boers were forced back offering little resistance; before midday they were in full ﬂight leaving behind several horses and wagons. By the end of the engagement, Mahon was still 8km away from the Nek, unable to take any part in the action as was Hickman. Commando Nek was found to be unoccupied. Seventeen Boer prisoners were taken, a dozen had been killed and several wounded Boers were found on neighbouring farms. The Berkshires lost ﬁve killed and ﬁve wounded; the Highlanders had one killed and one wounded. Private House of the Berkshires was evacuated to England; he was awarded the Victoria Cross. He took his discharge from the army but soon re-joined; perhaps he was unable to ﬁnd work. Whilst on garrison duty at Dover Castle in 1912 he shot himself, which earned him an unmarked pauper’s grave. Although the Regiment had his medals and citation, the place of burial was unknown. In 1993 the regimental association discovered the whereabouts of his grave in Dover and in 1994 the grave was restored and a headstone erected for an ofﬁcial unveiling ceremony.